BookLust: Tina Fey. Like a Boss. Tina Fey. Like a Boss. 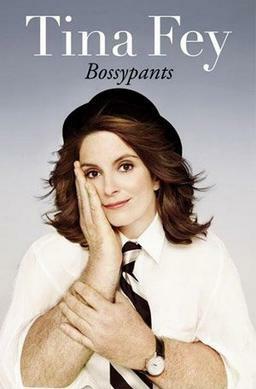 It seems like all comedians who just happen to be women are writing books these days, and I think it began with Tina Fey's Bossypants. I enjoyed Mindy Kaling's Is Everyone Hanging Out Without Me? and have plans to read books by Lena Dunham, Amy Poehler, and maybe Caitlin Moran. I anticipate all these books being hilarious and heartwarming, and I am sure I will finish all of them with, "Ohmigosh, if I knew [insert funny and awesome celeb name here] in real life, I just know we would be BFF!" It's possible I read Bossypants too soon after I read Is Everyone Hanging Out Without Me? And therefore they felt pretty similar. I think I was just hoping for a little more depth. It's not like I think Fey should have to confront the fact that she's a comedian who happens to be female all the time, but she really DID break a ton of glass ceilings and stereotypes and so much more at Second City and Saturday Night Live and 30 Rock, and I wish she spent a little more time talking about that. She basically says - if there's a jerk in your way, work around him or above him. Which is good advice, I suppose, but how? People like examples! Points to follow. And I feel like those were missing. Especially since the name of the book is Bossypants, I excepted more about how Fey dealt with bosses and then her own style as a boss. Also, the scenes Tina Fey describes between herself and Amy Poehler, and between Am Poehler and everyone else, are just fantastic. I now plan to watch a whole lot of Parks & Rec. And, obviously, read Amy Poehler's book. Funny feminists #ftw! My take on comedian memoirs is always that their life story is just kind of an excuse for them to talk about stuff, and I love listening to them talk. I actually *don't* like memoirs very much, so I never hope for much content here--I don't like backstage info at all, about any of my entertainment. That said, one thing I really felt when I was reading Tina Fey's book was that there was clearly a distance from her. I loved the stories, and I find her funny (I especially love audiobooks for ones like this), but I didn't feel like I got any closer to her, or understood her more as a person, or learned anything of substance that I didn't already know. It was a very polite book, for want of a better word. And I definitely agree that it's possible to read these too close together! I think I liked Mindy's book a bit more just because she had her persona--flaky-adorable-insecure--on pretty strong, and so I felt like I was getting more of her character, even if it was the character she made up. Tina Fey just kept me at a distance. I am right in the middle of Amy Poehler's book, and I think it's the best of the three. Possibly because it's the one I'm reading right at the moment, but it's the only one I've felt compelled to stay up past my bedtime to read one more chapter. Also, the photos she includes make it worth a library visit at the very least. I like LibraryHungry's comment that this felt like a polite book. I agree! That seems to be similar in both Kaling and Poehler's book -- interesting and funny and good stories, but not bare-your-soul details. That's ok, it just makes them a little different from other memoirs I think.